The increase in laparoscopic surgical operations has resulted in an increased focus on the fact that the method can be tough for surgeons who now works in front of screens for hours. Therefore, more and more hospitals in Scandinavia are installing the special lighting solution Ergonomic Lighting, which reduces fatigue and strained eye, which ultimately improves patient safety and working environment. 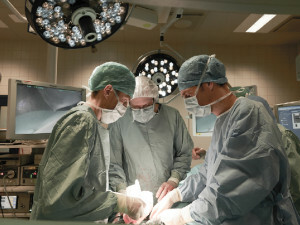 At Aarhus University Hospital Ergonomic Lighting is installed in about 100 different rooms. One of the new rooms is an operating theater for gynecological operations – both minimal invasive and open surgery. The solutions has the latest LED technology as well as interface with Karl Storz touch screen in the sterile field. Ergonomic Lighting is zoned, colored and white light for surgical and examination rooms with screen work. The lighting solution consists of the effective combination of complementary colors green and red light. “The contrasts are pleasant and very clear in the green and red lights,” explains Mikkel Seyer-Hansen. 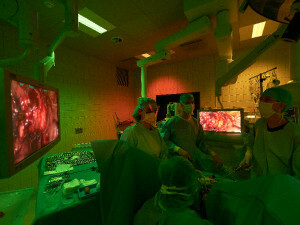 During keyhole surgery the room is divided into several light zones. Green light behind the screen to ensure high image quality, minimise reflection and get the eyes to relax. Red basic lighting reduces glare and ensures doctors and nurses good light to work, to collect equipment and documentation. At the same time the anesthesia have a white quiet zone for observing the patient and find drugs. Chromaviso has just conducted a user survey of 330 users of Ergonomic Lighting – in 30 hospitals. “We can see that Ergonomic Lighting makes a difference to the staff’s working environment and patient safety. For example, 92% of the surgeons points that their concentration is increased, and that the light ensures more quality in their work, “explains co-founder of Chromaviso, Claus Puggaard. 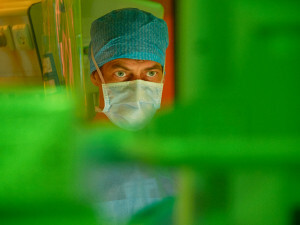 The study also points out that the red and green light creates a great value for the users and the possibility of dividing the operating room in different light zones is important for 92% of users. Chromavisos director explains the high user satisfaction with the combination of an innovative lighting concept, quality products, a user-friendly control panel and a thorough implementation. “When we get an order, we analyse the needs of each room and engages in dialogue with the project team, medico-technical department and with users. When the solution is installed, we follow up with user training and fine-tuning, so every room gets exactly the light settings to suit their needs,” explains Claus Puggaard.